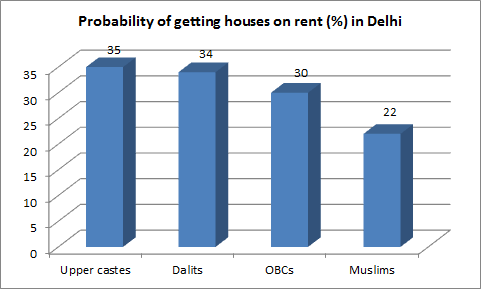 “This points to a significant disadvantage faced by Muslim applicants relative to upper-caste Hindus, who must expend significantly more effort to find housing”, the paper says, noting, however, that OBCs or Dalits do not face such strong discrimination. The survey, say the authors, was carried out “entirely remotely”, exploiting “one of India’s most popular online housing search platforms” over a roughly two-month period in the summer of 2015. The landlords in the study were seeking tenants for apartments or houses in Delhi, and its two largest contiguous suburbs, Gurgaon and in NOIDA. In all, the results are based on landlord responses to 681 unique applicants to 170 apartments, the authors say, adding, a large majority of listings (71 per cent) were for two- or three-bedroom apartments, with 20 per cent were for one-bedroom properties, and 9 and had four bedrooms. The distribution of properties differed somewhat between the city and suburbs, with fewer one-bedroom flats in the suburbs. City flats were about one-and-a-half times more expensive per square foot (Rs. 28.5 psf compared with Rs. 18.1 psf in Gurgaon or NOIDA), and were smaller on average (at a little over 1100 sf, compared with an ample 1600+ sf in the suburbs).